Historically, Shiloh was a two day battle. On day one, the Confederates attacked Union positions, catching them off guard and putting them under great pressure. The fighting went on until dark, but the Union managed to just hold out. The following day, organised and reinforced, the Union went over onto the offensive and pushed the weakened Confederate forces from the field. In doing a Shiloh game there is much to consider in reflecting this see-saw battle. 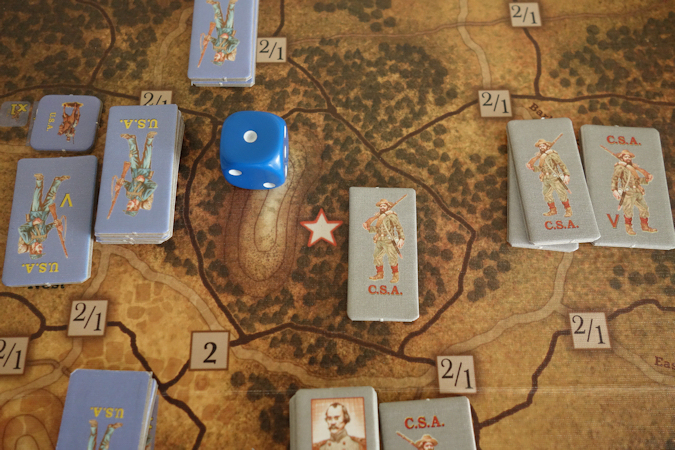 The attacking Confederates have the advantages of surprise, the ambushed Union need rules that substantially hamper them without totally making them unplayable and too vulnerable and there must be a chance of day one ending in a victory. That is a tall order to get that balance right and brings the potential of a lot of rules overhead to do that. The good news is that Clash of Wills does all of this in a really elegant and enjoyable way and without the rules baggage. The game engine has two main elements that make it really easy to deliver the flavour of this battle. Firstly we have Order Displays. 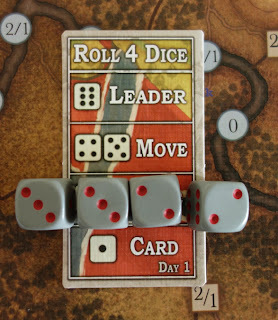 During a players ‘go’ they roll a number of dice as directed by the order card. The numbers rolled are matched against the order display and will determine how many move or fire orders etc can be made by that player during that ‘go’. 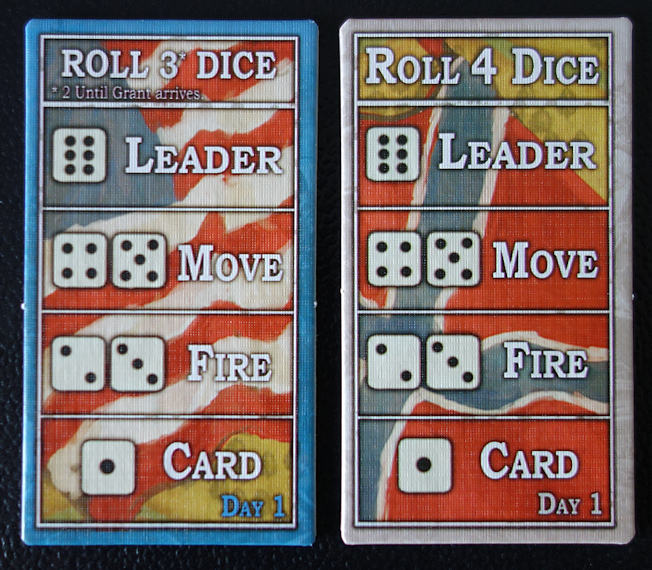 On day one, the Confederates get to roll 4 order dice and the Union can roll 3. On day two, the Order cards are flipped over and that situation is reversed, so now the Union get to roll 4 dice and the Confederates just 3. 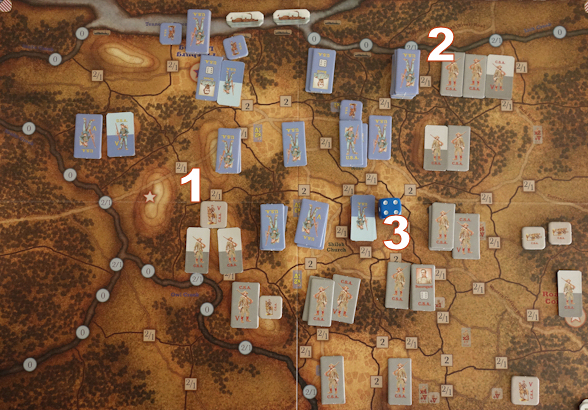 So in such a simple mechanic, the performance of the armies is adjusted over the two days to reflect the see-saw effect of fortune. 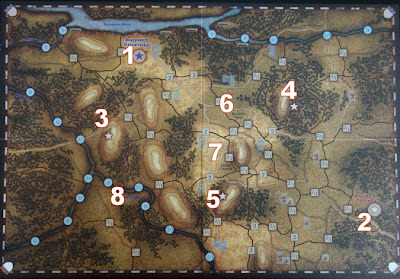 In addition, at the start of the game, the Union only actually get to roll two order dice until Grant arrives and only then does it go up to three order dice. Secondly, there are cards in the game (this game is not card driven) that can be played by the players from their hand to bring in tactical nuances to the game and indeed, it is via the cards that Grant arrives. Here is the clever bit - at the start of play, the union ‘constructs’ their deck by randomly selecting 10 cards and adding the Buell (leader) card to them. This forms the bottom of the deck. Then 4 more cards are taken and the Grant card is added to them and these are placed on top of the deck to form the middle of the deck. Finally, the remaining 5 cards are shuffled and placed on the top of the deck. The deck is now like a layered cake. The Union will have to burn through the top 5 cards before getting to the next group of 4 cards, which will have Grant randomly placed. The arrival of Grant is important for that extra order dice. 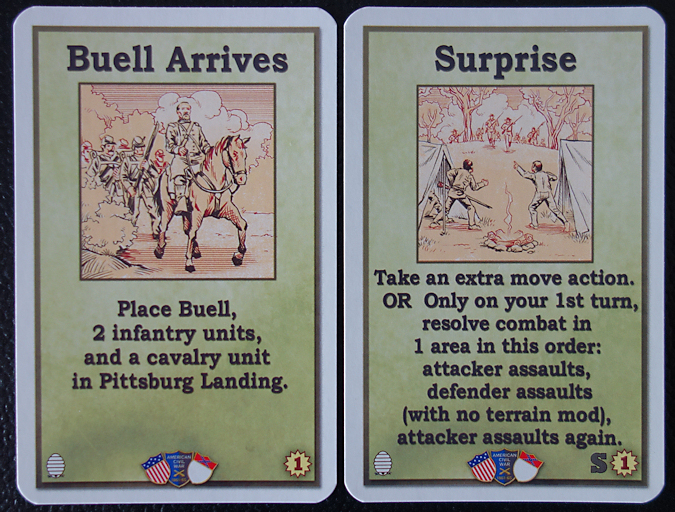 Then the final 10 cards will be played out with Buell arriving at some point and bringing some reinforcements. This is such a clever way of keeping the game tense, with the Union player desperate to draw Grant and Grant being placed in the deck in such a way, that within a rough but variable timeframe, he will arrive and help turn the Union fortunes. The Confederates are intent on making hay while the sun shines and doing as much as they can while they have the edge. Once all cards are played, followed by a ‘1’ being rolled on the Order Display, the first day will end. So between the manipulation of how many order dice a side gets and the pre-construction of the Union card deck, the flow of this battle is captured without additional rules at all - superb. Combat is essentially done by rolling dice and causing hits. The hits are re-rolled and are either converted into casualties (flip) or retreats. Close Assault will generate more casualties. Fire will mostly cause retreats. With the main aspects of the game explained, I will just present a quick AAR to capture some other points. 1/ Pittsburg Landing - sudden death VP area for the Confederate. 3/ 4/ 5/ are the three VP areas, they are all hills, so tough to capture. Holding all three will give a victory at the end of day 1 and holding two out of the three will give a victory at the end of day 2. 6/ Hornets Nest - historical interest. 1/ & 2/ The Confederates open their attacks here. 3/ This is one of the VP hills. It starts unoccupied, so this is an easy one for the Confederates to just move into. The starting hands are fixed. 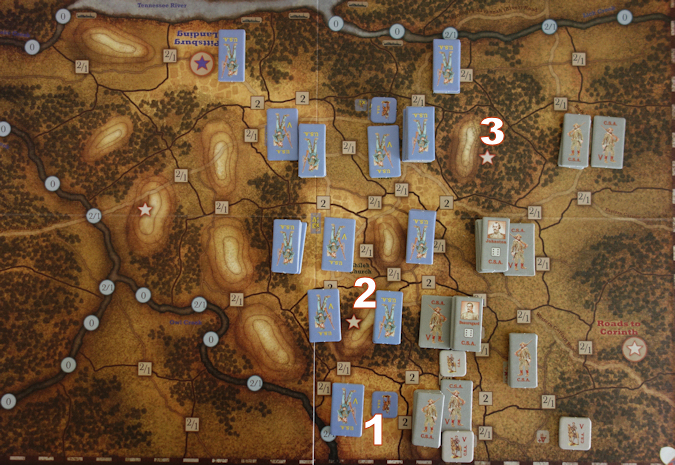 The Confederates get 7 cards, all power packed to give a good start to their offensive. The Union get just 1 card, that allows them to retreat! TURN 1 (example of sequence of play). 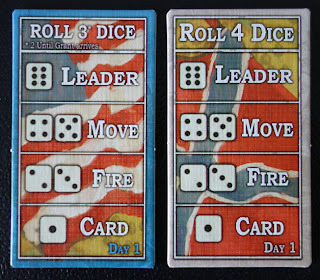 The Confederates roll 4 dice and place them on their order card. They just happen to all be ‘fire orders’. The confederate plays the ARTILLERY card, which enhances all of that firepower. The confederate player chooses to use 3 of these fire orders to open his move, in the hope of weakening the enemy, which causes a flip and a retreat. Plays a MOVE card. Activates an area and crosses a border that allows two units to cross (but veteran units only count as half a unit, so 2 veteran units and 1 regular unit can cross) into the enemy area. They choose not to immediately engage in combat. They can fight at any time in the turn, but must fight at the end of the turn if they have not already done so. This allows other units to enter the area from other directions if the player chooses. Plays a MOVED card. Enters the vacant VP hill. Hills can be tough to attack. Uses the last remaining FIRE order from the order card to fire from this new position - no effect. Plays a MOVE card. Infantry advances into the hill position below Shiloh Church. Plays a SURPRISE card. Plays it for the move option and moves another infantry unit onto the hill below Shiloh Church. Plays a SURPRISE card. Plays it for the attack option which modifies the combat sequence so that the attacker assaults first, then surviving defenders assault back and then the attackers get a bonus second attack. The confederate attack value is 7 dice, but 6 is the maximum that can be used. Result is 3 hits and they become 2 casualties (flip) and 1 retreat. The player chooses to retreat the veteran unit and the cavalry stays to fight back, they use just 1 D6, but this does hit and cause a flip. The Confederates then get their bonus surprise attack and go again, they score another 3 hits, all are casualties and the cavalry piece is removed from play. The Confederates now occupy that area. 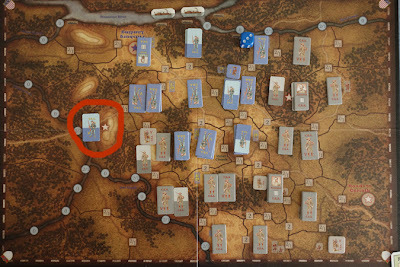 (The Union player remembers too late that this might have been a good time to play their RETREAT card). Plays a SURPRISE CARD. Plays it for the attack option at the lower VP hill. The Union do not want to retreat from this important position, so choose not to respond with their RETREAT card, they will just take their chances. The Confederates attack first (because of surprise). They roll 5 x D6 and score 4 hits, all are retreat results and so all the defenders retreat to Shiloh Church. Giving up the hill is a real loss, especially as defenders on a hill get a combat bonus - makes them tough positions. 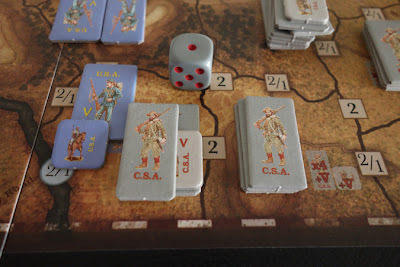 The Confederates do not have any cards left and there are no order dice left on their display, so it is now the union player turn (note you do not have to play all of your cards). 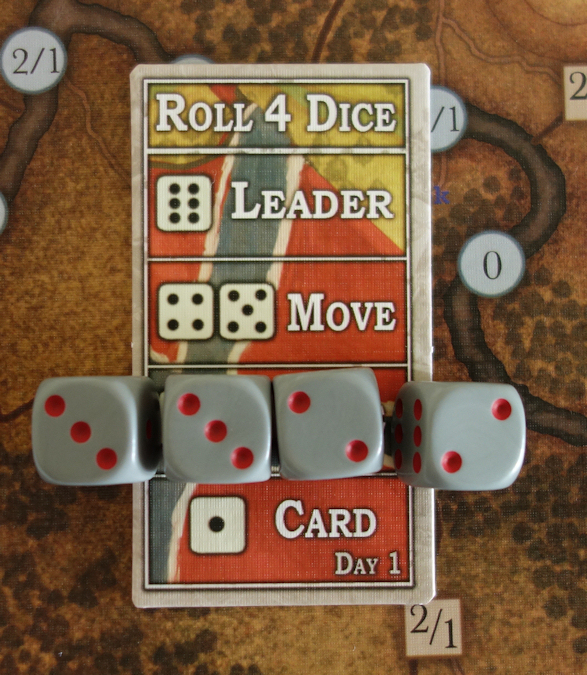 Before Grant arrives, the Union player only gets two order dice. Unfortunately they roll two FIRE orders. (unfortunate because MOVE orders would have allowed a counter-attack at the VP hill and a CARD order or LEADER order would have allowed a new card to be picked up - the Union player needs to get through their cards quickly if they are to receive the GRANT card early in the game). They fire on the top VP hill and force the lone defender to retreat, pity they do not have a MOVE order or MOVE card to take advantage of that fire. They roll 4 order dice and get 2 CARDS, 1 FIRE and 1 MOVE order. They sensibly use their MOVE order to re-occupy the VP hill. They roll their order dice and get a FIRE and a MOVE order. They move a veteran unit into the top VP hill (probably unwise) to assault. The defender fires first and gets the hill bonus, causing the veteran unit to retreat before it gets a chance to attack - oh well, at least it did not suffer casualties. The game continues with individual turns going quite quickly, keeping both sides fully engaged. With the sequence of play fully outlined, the rest of this AAR will just be a brief synopsis of how the game panned out. Alarm for the Union as Confederate forces break through on their left flank. The way to Pittsburg is open. 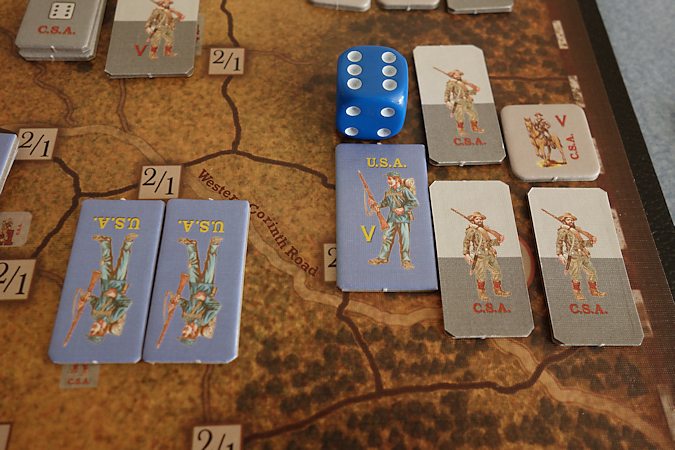 A Union veteran unit moves onto the high ground to block the way, but falls back when fired upon. The Confederates are not really strong enough here to take full advantage of this opening and if the Union get their act together, they could be in trouble. That third VP hill is an important objective. The Confederates hold two of the three VP hills, if they capture the third by the end of day 1, they will win, so as the day closes (running out of cards), they put in an attack (see above), which could have gone either way, but it went in favour of the defenders. 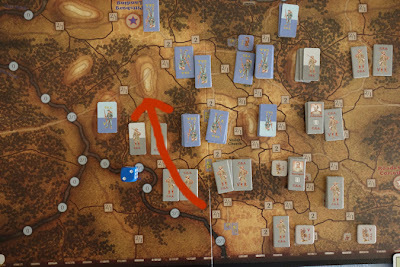 On the Confederate right flank (marked by the blue die), they have made repeated attacks against the Union and while not taking ground, they have substantially weakened the defender, who has been having to feed in units from their now weakening centre (Hornets Nest). The day ends because one side (Confederates on this occasion) have drawn all their cards and then rolled a CARD result on their order dice. The Union always get the last turn and in this instance, they draw the GRANT card - but of course too late to do anything for day 1 (in all my previous games, this has usually been obtained much earlier in the day). 1/ does one player control all 3 VP hills? if so they win. 2/ take the difference in casualties and roll 2 x D6. If the result is equal or less than that difference, then the side with the lower casualties wins. If neither of the above happens (as in this case) then move to day 2. 8 of the day one only cards are taken out of the game. 9 day two only cards are added to the deck. Johnston is removed from play. Flip the order displays to their day 2 side. Confederates now only roll 3 order dice and the Union get to roll 4. 1/ Confederates are blocked, but holding their own, this has become a stalemate. 2/ Powerful Union forces (the day 2 reinforcements) are pressing forward, planning to sweep around the Confederate flank towards the Corinth Roads (sudden death victory point area). 3/ The Union have suffered heavily here from fire and the area is vulnerable to a Confederate attack. 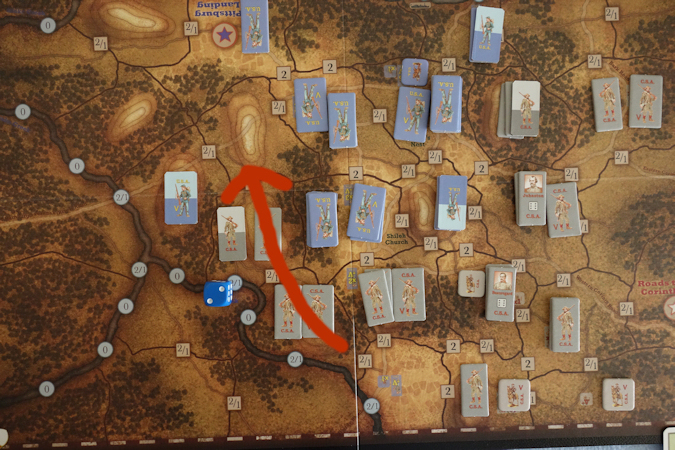 1/ A dangerous moment for the Confederates, the Union break into their centre (by the blue die) and are within striking distance of Corinth (1). The Confederates attack and get a retreat result but the Union play a HOLD card, which negates the retreat. 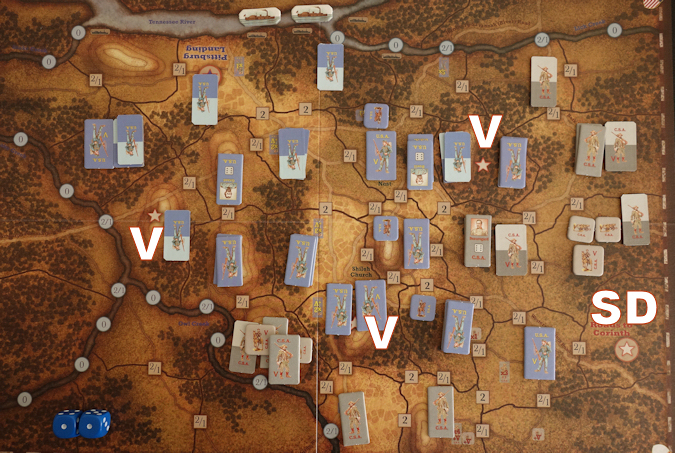 The Union veteran unit has battled its way into the ‘Roads to Corinth’ area and just scored 3 casualties. That will remove those three flipped Confederate infantry units (above). The lone cavalry unit survives, so the attacker has to retire back - but the end seems close. 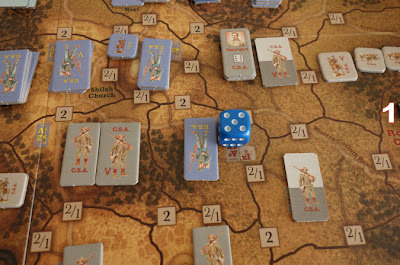 The veteran unit fires, driving the cavalry out of the Corinth area, but they do not have any move cards or orders to advance into the vacated area. However, it matters not, the day ends as the last Confederate card has been drawn and a CARD order has been rolled. The Union have managed to capture all three VP hills (you only actually need two of them on day 2), so they win the game. V shows the three victory hills - all Union occupied. SD is the sudden death victory area that gives the Union an instant win if they capture it. A nicely presented game at a very good price, Clash of Wills gives an entertaining game for a relatively low investment in rule reading. 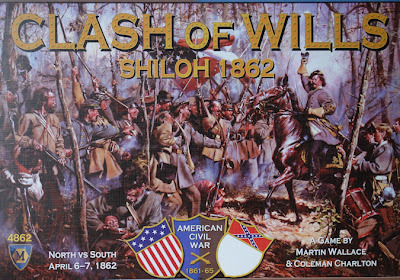 The see-saw action of Shiloh is nicely captured and the system does manage to bring tension into the game and both players are equally engaged. Size - The board is compact at just 14" x 21". It is hard mounted and folds into 4 panels. You just need a bit of space to one side for the order displays (playing card size) and for the game decks. Solitaire -This is a two player game that plays well as a solitaire game. The order dice means that you cannot be sure what each side will be able to do in their next turn. You will need to manage up to a 5 card hand for each side, but this is no big deal and you can keep the cards face up for easy viewing. I often get caught up in the play and forget to use cards, sometimes for several rounds. Complexity - The game does not suggest a complexity level, but I would say 2 or just above out of 10 would be right. It has a 16 page rule book but it is smaller than the usual booklet size that you get in boxed games and is heavily illustrated and exampled, with large font and single column setting. It is all very straight forward and no more than a 15 minute read. Time - The box says a game can be completed in around an hour. My games have been more in the region of two hours or so. I understand that the first game in the series had artillery units and that this one doesn't. How does that affect this game? I realize the heavily wooded battlefield limited the use of artillery, but I think it would have been nice to include them. Could you use the artillery rules from the bull run game and make your own counters based upon historical order of battles? 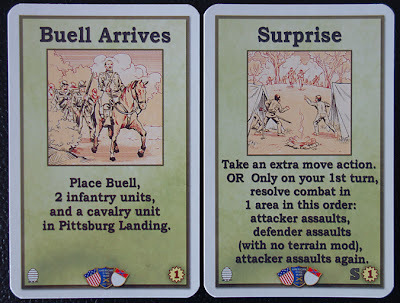 I have played Bull Run but do not own it, so cannot physically compare the two or their fire mechanics. However, the Shiloh game does make a comparison and says that in Bull Run, the artillery represented massed batteries, while in Shiloh, they represent batteries attached to formations. I suppose I would tend to stick with that deliberate distinction, it seems to work fine in the Shiloh game. In the game, firing is actually referred to as artillery fire rather than infantry fire with artillery support and so I think this game has made the fire to be artillery based and assault as infantry based, so I doubt that the mechanics would allow you to bring in extra artillery without you having to dig deeper and tweak more than you may wish to.